It’s not a good idea to use the van’s starter battery to power the electrical items in your conversion. It’s too easy to leave yourself with a flat battery and no way to start the engine. The van’s charging system can be used to help charge a second battery that you isolate from the starter battery, but there are some constraints. If you’re trying to charge a large house battery, you may need some additional equipment. You can think of the van’s engine like a big generator that’s producing electrical power you could use to charge your auxiliary or house battery. How much power you can take from the engine is governed by the size of the alternator. You have to be careful because the stock alternator isn’t designed to produce much more electrical power than the van uses already. Not to worry – there are other options for charging bigger batteries from the engine too. Our van came with the optional auxiliary battery installed. The auxiliary battery is a 95 Amp Hour battery, exactly the same as the starter battery. It’s OK for powering a couple of lights and maybe recharging a phone and laptop, but it’s not really suitable for a full van conversion. We have almost no use for the factory aux battery because we added a separate 750 Amp Hour house battery. However, if you are planning on using the engine to charge your house battery, the way the factory aux battery hooks in to the van’s systems is pretty much the same as lots of people use for any small to medium size second battery. The aux battery is disconnected from the rest of the van’s electrical system until the ignition is on. Then, a relay closes that connects the aux battery to the starter battery. Now, the two batteries both take a charge from the engine alternator. Also, whichever of the two batteries has the higher charge will start “charging” the other battery until their voltages are equalized. All the stuff that makes this happen is under the driver’s seat. We wrote a description of how to hook in to the Sprinter engine battery or the factory-installed Aux battery. The photos in that post will help you understand what’s needed to hook in to a charging source. Overall though, the factory-provided aux battery setup isn’t really designed to be used in the way you’ll want it for a conversion van. You might be better off using a different approach. We’ve listed several below. The really cheap-and-nasty version is to just add a solenoid between the starter battery terminal and the auxiliary battery that you add, with the control wire for the solenoid being triggered by a cable that’s only hot when the ignition is turned on You can find this at the EK1 terminal. The wire you want is the blue/yellow one. It’s “hot” when the engine is running. You are only taking enough current from the wire to open a relay, so you’ll be well within its 10A limit. The Stinger solenoids (80 amp should be sufficient, but there’s a 200 amp version too) are perfect for this job and dirt cheap. That works OK if the aux battery you add is not too much bigger than the starter battery. In the Mercedes Body and Equipment Guidelines it says the maximum charging current for the starter battery and any other batteries should not exceed 40 Amps. The downside is that the battery isn’t really receiving the type of charging current and voltage it wants. Lead-acid batteries want to be charged in three stages (bulk, absorb, float) and need different voltages/currents during each of those stages. A solenoid just closes a switch between the starter and aux battery. Most of the time that’s OK, because the aux battery will first equalize its charge with the starter battery, then both will charge at the same rate if they are the same size. You can replicate the Mercedes way of doing things if you want. There isn’t much difference between this and the dirt cheap version, other than if you use Mercedes parts you’ll be more likely to fit the stuff in the original locations. You can read what’s required in the Retrofit guidelines for auxiliary battery in 2007+ NCV3 Mercedes Sprinter or Retrofitting an auxiliary battery with isolation relay in a pre-2007 T1N Sprinter. These guidelines show how the auxiliary battery is fitted in Sprinters, and list the parts needed to do a factory-style job. Of course, you don’t need to use Mercedes parts. Blue Sea systems make a nice battery combiner, the Blue Sea ML-ACR 7620 for around $180. It is magnetic latching, which means it takes no current to keep the “relay” inside the battery combiner open. You could still use the Stinger relay mentioned above in this situation too. Again, this solution is only really useful if your auxiliary battery is the same type and size as the starter battery. Sterling make several DC-to-DC chargers from 20 Amps to 120 Amps. This type of device works by taking a DC input from your engine battery and alternator, then ramping it up or down to make it suitable for the aux battery that it is charging. In other words, it’s a proper battery charger that happens to work on a 12v supply rather than the more usual 120v supply. The 55A version is probably the largest you should use in a Sprinter, and even that might be too much for the alternator in the long run. The benefit of using a proper DC-to-DC charger is that it can sense what state of charge the aux battery is in, and change its output accordingly, independent of the engine battery. That means the aux battery can still be in bulk charging mode even if the engine battery is in float. This works much better for aux batteries that are a different size or type than the engine battery. Obviously that means your aux battery can be bigger than the starter battery, but you still need to be careful how much power you draw from the engine alternator overall. Dave Orton on the Sprinter Forum pioneered the use of a 12v to 120v inverter to take 12v power from the running engine and turn it into 120v, then send that 120v power to wherever the house battery is placed. The 120v runs a charger (or runs through an inverter) to recharge the house battery. Why would you do this? The inefficiencies are crazy. Even a good inverter is only around 90% efficient. Then the inverter/charger at the other end is probably only 80% to 90% efficient as well. That means you’re losing a good 20% of your energy before it gets to your auxiliary battery. The real benefit is in the gauge of wire you need. 120v wires can be 10, 12 or even 14 gauge – a regular extension cable will set you back less than $20. If you are running them from the front to the back of the van, that’s a massive savings over the equivalent 12v cables you’d need; probably 25 feet each of + and – 2/0 gauge flexible welding wire at $155. For some people, the inverter-to-charger approach is likely to work really well and be a very cost-effective solution. Be careful though. Even though Dave and many other people have used this approach with relatively large inverters, anything over a 400W inverter is likely to draw more amperage from your engine alternator than Mercedes allows in the Body and Equipment Guidelines. At the beginning of this article, we said that the limit on how much power you can draw is based on the stock alternator. The alternator is pretty tightly wired in to the rest of the van’s electrical system so you aren’t likely to just rip it out and replace it with a larger one. Instead, there’s space on the engine block to add a second completely independent alternator. Avanti on the Sprinter forum added a Nations alternator with a Balmar MC-614 regulator. It also appears that Advanced RV offers this type of setup on their builds. The alternator provides 270 Amps of charging current (200 Amps at idle) that isn’t being used for anything else. Also, once the battery is charged, the alternator basically “disengages” so it’s not slowing the engine down. This type of option costs around $2k plus installation. It involves adding a second alternator on a bracket in the engine bay, and running wires from that second alternator into the van (or to wherever the extra batteries are). The benefits of this system over a solenoid, combiner or DC-to-DC charger are that you aren’t limited to 40 Amps of current, so you can charge any size battery of any type. The Balmar regulator can be programmed to support most types of lead-acid and lithium batteries. This is the approach we took. We were going to use the Dave Orton inverter method to get 800W of power from the engine to the back of the van. However, we’ve found that our solar panels will pretty much recharge our van while we are parked or driving without much assistance from us. We might still add the engine inverter in the future, if for instance we find that the solar panels can’t keep up over the winter. But for now, we haven’t bothered to hook into the engine powered electrical system for any of our charging needs. Hi again – I essentially have the same van as yours less the 4×4. I was wondering what you ended up using your OEM aux battery for…..or maybe not at all? I am trying to decide how to set up my vans electrical system. I would like to get a 200w solar panel system with additional house batteries. Occasionally, my family will be following/meeting other family members in their RV at campgrounds so I want the option of hooking up to shore power. I was thinking of dedicating my OEM aux battery to just the LED lights or USB charging accessories and then starting from scratch with another small bank of batteries to tie into the solar panels. I would like the shore power to charge my house (new bank from scratch) batteries/power 12v accessories while hooked to SP. My van set up will include an ARB fridge, Espar heater, dedicated stereo/12v TV system for the kids in the back and some LED lighting. My wife wants a microwave but I would only want to use it when hooked to SP. I won’t be boonedocking for several consecutive days at time. I was hoping that you could make a recommendation based on your research and real life experiences with your van. I know you have done extensive research and value your opinion and suggestions! Thanks again for all of the great information that you have out there! One side note: I don’t want more than 200w solar system as I will be also installing a roof rack to haul our standup paddle boards. Adam, we really don’t use the aux battery for much. 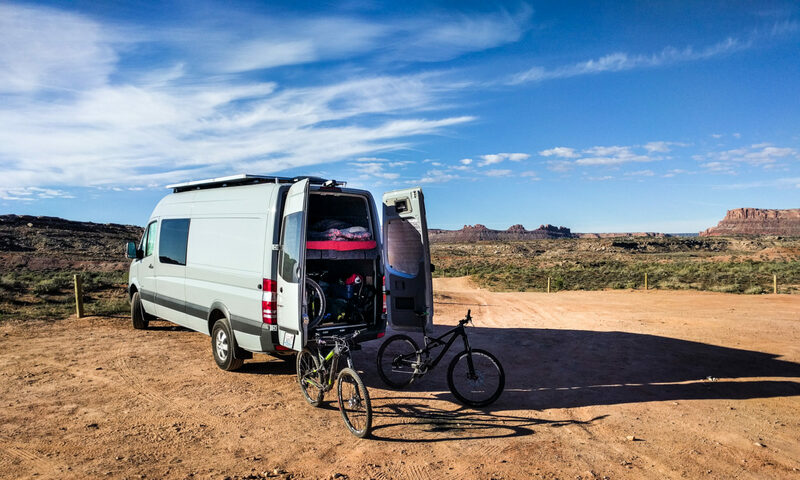 It’s not designed to be used the way most adventure van converters want to use it. I think if you do as you planned and just use it for low-draw items like USB charging and/or LED lights, you should be fine. Especially because you say you’ll be driving most days so you’ll get a chance to recharge the battery. This thread on the Sprinter forum goes in to lots of detail/opinion on how to use or not use the aux battery. The 200W solar panels should be sufficient to keep up with the ARB fridge, so you’ll be able to run that pretty much “for free”. If for some reason your house battery ended up flat (kids watched too much TV?) then you could always move the ARB across to the Aux battery as a temporary measure. Without the need for a 120v supply from the battery, you can probably get away with a 200Ah usable battery. But do the math to check this. A battery-to-battery charger would let you charge the house battery from the engine while you were driving. You would also probably want a battery charger for charging from shore power, and a monitor to know exactly what the battery’s state of charge was. It’s hard to make specific product recommendations, because everyone’s needs and budgets are different. An AGM battery or a lithium battery would both be fine inside the vehicle. There are several solar charging options for you too, from simple PWM systems to more efficient but more expensive MPPT systems. One thing to consider if you’re going to put the SUPs on the roof: any shading will prevent the solar panels from producing power. Even if one corner of the panel is in the shade, the whole panel will be as good as useless. That means being careful about which way round you park, and understanding that you might not get the charge you wanted while you’re driving along. Thanks for the reply dieselfumes. I have done a little bit of research on ctek 250 dual with smartpass and that seems like it might be a possible option…..although I would still like the option of plugging into shore power and don’t fully understand how this would come into play. If the van is parked inside for weeks at a time, does the ctek set up how a 120v plug for the times the van is being stored? I’ve not used the CTek and I’m not familiar with it. From a quick look, it’s just the 12v side of your system. It looks like you’d need a separate component to provide you with 120v to 12v power. For instance, you can get an inverter/charger. That would take the 120v shore power input and use it to charge your battery and power your 120v devices, plus if your house battery was big enough it would also provide 120v power from your battery when you didn’t have shore power attached. If you were just worried about keeping your 12v batteries charged in storage, a trickle charger would do the trick. I have the aux battery under the hood. I have a smart battery charger. I would like to put a trickle charger on. I don’t know where to hook it up or will it charge both batteries at the same time or do I need to do each battery separate? First off, although the starter battery seems to run down over the course of a month or so on some vans, the aux battery is good for several months if there are no loads attached to it. If you do want to charge the batteries, you have to do each one separately because they are separated by an isolator whenever the engine is switched off. To charge the aux battery that is under the hood, you can attach your charger directly to the battery terminals. Don’t go by wire color though – at least on my van the positive terminal has a black wire attached to it and the negative terminal has a brown wire attached to it. Look for the + and – symbols on the battery case. To charge the starter battery you also attach the charger under the hood, to the special jump start terminal. 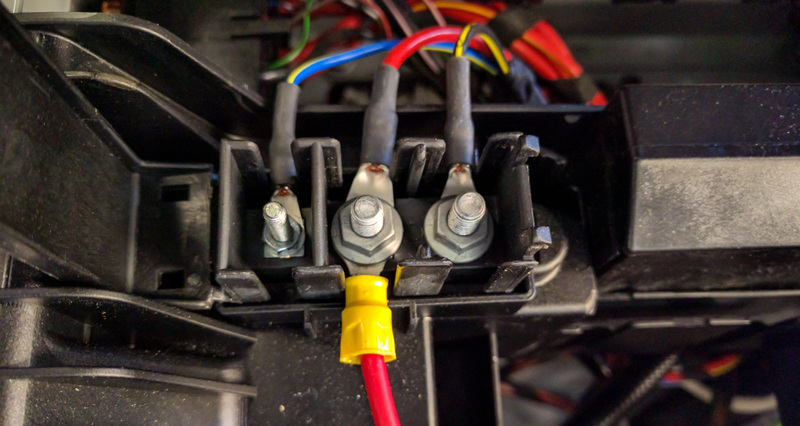 If you read our post on jump starting a Sprinter, you’ll see that there’s a red plastic cover on the positive attachment point. Slide that back to expose the metal terminal and clip the battery charger to it. You can clip the negative terminal of your charger to the metal of the engine or to the brass stud on the driver’s side of the engine bay above the aux battery. While you could theoretically use one charger to charge both batteries by just running a wire from the positive terminal of the aux battery across to the red plastic battery jumping point, it’s probably not wise. The two batteries won’t necessarily be at the same level of charge, so if your trickle charger has any built-in smarts, it won’t know how much charge to supply. You could end up over-charging one of the batteries or under-charging the other. 50% isn’t good, but it isn’t the end of the world. So long as it hasn’t been sitting at that low charge level for a long time, you should be able to bring it back. Good luck! Hey Dieselfumes- tapping your obsessive (thorough) research yet again. Did you end up going with one of the Sterling DC to DC chargers? Any thoughts now that it’s been in for a while? Seems like a good solution though pricey. I have the Stinger battery isolator, but from what I’ve read the cheaper battery isolators have significant voltage drop- meaning never getting a full house battery charge on the isolator. What’s your strategy for using the IsoTemp water electric heating unit? Mostly when driving? Run it in your driveway plugged in to shore power to preheat for day trips? Have you done a 2-3 week road trip with frequent hot water usage? Planning on installing the water tank and next spring. Leaning toward the slim IsoTemp , but considering an Espar D5 or other diesel fired system. Sadly, nothing beats the energy density of fossil fuels. (We have the Mr Heater propane outdoor,shower system, works great, but takes a few minutes to set up/break down. Not very convenient, but under $300). Hey there! We have not yet hooked up a charging source for our house battery to the engine. We have an 800W inverter that we might test out, but the more I research it, the more I think the Sterling is the way to go. Like you say, pricey, but I think it provides the best regulation of battery charging. Especially in our case with a lithium house battery. We have a Stinger but we’re using it to stop some loads from drawing from the aux battery while the ignition is off. That’s a different proposition than trying to charge a house battery. The isoTemp gets heated either when we’re parked up at home using shore power before a day/weekend trip, or using our house battery when we’re on the road. We sized our battery accordingly. The road trip situation has worked well for us on a couple of 2+ week trips with some judicious water conservation. If we’d been able to park in full sun rather than needing shade for the dog, we’d have had no issues. Again, our solar setup is sized for that use case. The slim isotemp and the D5 are not mutually exclusive. You can use the D5 to heat the isoTemp up and then have stored hot water for later use. Then, you have on-demand water while you’re traveling, and you replenish that using the D5 while you’re stopped. You can also rig the isoTemp to be a diversion load from your solar for when your batteries are fully charged and there’s still sunlight to provide “free” power. It really depends how automatic you want your hot water to be. The Mr Heater setup is a lot less hassle than plumbing stuff, but like you say the setup/tear down can wear on you. Thanks again for the detailed reply! Slowly putting a plan together. I’m working from the top down (solar, racks, fan, lights, etc). Walls and insulation are in (along with tons of extra wiring. Espar heater next, then a break, build lower cabinets, then figure out water and shower system. It’s easy to have the van dominate your life at times, but winter is a good time to make progress. Randy, I share your concern about altering the load on the charging system. The Mercedes upfitters guide is pretty clear about not using a different battery configuration than the standard one. They say “Do not connect batteries with a capacity over 100Ah directly to the vehicle’s electrical system due to potential damage to the basic vehicle.” However, they don’t say exactly what that damage may be or how likely it is. Several people on the Sprinter forum have used the battery trays you describe, with 6V deep cycle batteries instead of the regular aux battery. So it’s obviously possible and it doesn’t appear to have led to any catastrophic failures. At least, not that anybody has admitted to. However, it’s possible that the life of some components would be shortened – for instance the alternator working much harder, or the stock battery getting under- or over-charged (depending on the chemistry of your deep cycle batteries). So I wouldn’t favor that solution, but I know exactly what you mean about it being space-saving and simple to implement. We wrote more about why the aux battery isn’t a good starting point for a conversion here. Adding a DC-to-DC charger would at least limit the load on the alternator. Placing the batteries elsewhere under the vehicle would mean you could keep the factory aux battery as it is and also have the “house” battery setup that you want. Those options make your install more expensive, but they also give you extra benefits. Thank you for posting this. I have the factory 100ah factory aux and currently using that to power an Espar D2, some LED lights and a ISOTherm fridge. I’m looking to upgrade to about 200 amps of power in the most simplest way possible while still getting engine charging. All this stuff is currently wired to the aux battery under the drivers seat through a BlueSea fuse panel. Here’s what I’ve purchased so far. 1x RB Components Battery Tray and 2x Fullriver DC224-6 GC2 6v 250ah batteries. Based on your articles, it appears that this is going to be a problem as a drop-in replacement correct? The plan was to wire the 2 6v in series and simply replace the OEM 100ah battery. Would simply replacing the OEM relay with the one you linked on your site (Blue Sea ML-ACR 7620) be sufficient for making this work in your opinion? Michael, the OEM relay does some clever things. It waits for a while after the engine starts before closing the connection, so that the starter battery has a chance to recharge before the aux battery is added to the circuit. The Blue Sea ACR is pretty smart too, but doesn’t work quite the same way. Would it work? Probably. Before you go down that path, I’d find out what the rating of the factory relay is. It would save you some money if you can leave the original relay in the circuit. But that’s not the only thing to consider in this type of replacement. 1) The alternator is specced to have no more than 40A additional draw over what the van’s systems use. From others’ experience, it sounds like it *can* provide the charge current for higher capacity batteries, but it’s not designed to do so. 2) Different battery types need different charging profiles. If you rely on the Mercedes system to regulate charging, it’s possibly going to undercharge your new aux battery system or overcharge your house system. Or both. 3) Cable thickness from the aux battery is designed for a 100Ah battery at low draw rates. Adding a higher capacity battery and discharging it at higher rates may exceed the safe rating of that cable. 4) Lead acid batteries take a long time to get from 80% to 100% charge. Do you drive long enough each day to replenish the batteries? Like, 4 hours or more? I’ve used a lot of weasel words (“might”, “possibly”, “could”) because other folks seem to have swapped out the OEM aux battery for higher capacity SLA or wet cell batteries and have not reported issues. Yet. However, I would not do this. I’d much prefer to spend the money on a battery-to-battery charger and put the house battery bank somewhere closer to the place the power is going to be used – inside the vehicle. Obviously you can’t do that with the FullRivers because they will vent hydrogen and sulphuric acid. Do you actually need the RB Components battery tray? Do the FullRiver batteries not fit on the OEM aux tray? Another quick question- do you have the optional 220 amp alternator? It was one of the few options that came with my van. Seems like I should have plenty of available amps for charging house batteries or perhaps heating water via an IsoTemp, but I haven’t looked at the specifics of just how many amps I can pull off the 220 amp alternator for heating water. Definitely headed toward the Sterling B2B charger in the next round of van projects. If only LiFePo batteries would drop significantly in price… I’ve been running them in my electric cargo bike for years, but even that tiny 48V LiFePobattery was $600+. (But 28mph loaded with groceries is pretty rad for a bike!). We don’t have the optional 220 Amp alternator. You’d think that the larger alternator would give you more headroom over the Mercedes recommendation of 40A max. draw from the system. We still haven’t hooked up any type of engine-based charging system. The Sterling is a great option, but our house system is isolated from the van chassis. Adding the Sterling would change this because it uses the van chassis as a common negative/ground. Instead, we’ll probably add an inverter-based charging system. Our IsoTemp with a 750 Watt element draws around 850 Watts from our battery through our inverter. 850/12 = 70 Amps (or 850/14 = 60 Amps). Of course, if you are using the alternator to charge your house batteries, you can run a higher load from the batteries than you are replenishing at the same time. You’ll draw the batteries down a little bit, but after the water has heated up (our 4 gallon tank takes about an hour) the charger will continue to replenish the house batteries. LiFePO is really nice. Hardly any Peukert effect, and no tail off in charging above 80%. I can’t see the price changing radically over the next five years. Hopefully quick question for you..
I’ve been doing a lot of thinking on this and am curious if you don’t tie into the starter battery for the sprinter, do you at least tie into the overall vehicle ground? It seems like this would be a good idea to prevent the possibility of having a 24V spike in electrical if somehow the batteries shorted to be in series. It seems unlikely but not out of the question and I am just curious what your thoughts were.. i also would like to use only solar, but am torn on if i need to connect to the vehicle ground. Matt, we didn’t tie in to the vehicle ground. It would be simple enough for us to to do, and some people recommend it. However, in our situation it would provide an easier path for a short circuit than if we isolated the whole house battery from the vehicle entirely. So our thought was that keeping the house system separate from the vehicle ground made it one degree safer. I can’t think of a situation where the house and vehicle batteries would short in series. Our house battery has no way to produce 24v on its own because it’s made of four separate 3.6v battery cells. If the house positive shorted to the starter negative, then you’d have to be touching the house negative and the vehicle positive in order to get a 24v shock. That’s probably pretty unlikely. We did not purposefully connect our solar system to the vehicle ground, although the solar panels are probably grounded through their frames. Although it’s possible that that may, in turn, create a path to ground for our house system we measured zero continuity between the house system and the vehicle chassis. If you want to install a DC-to-DC charger to utilize alternator charging on your house battery, you’ll need to tie the house battery to the vehicle ground. That’s because the DC-to-DC chargers typically use a common negative/ground pole. So it’s really up to you. There are potential benefits to using the vehicle ground, but we decided the benefits of not using it outweighed that in our situation. Either option is a legitimate possibility and it really depends on your proposed design and the weight you put on different safety options. One thing we did do was connect the grounding cable from each component’s casing (not the negative cable, but the separate grounding location) to a common bus bar. The bus bar is NOT connected to the vehicle’s chassis. That means that even if there is a stray short, there will be no potential difference between each component’s cabinets. That means that you shouldn’t ever get a shock from touching both the solar charger cabinet and the inverter cabinet, or the inverter cabinet and the distribution panel, for instance. In addition, when we have shore power connected, our inverter automatically connects to the shore ground connection. When we’re producing 120v through the inverter it automatically disconnects this circuit. Thanks, again, for these helpful posts! I especially appreciate your references to original sources. Above, you said “In the Mercedes Body and Equipment Guidelines it says the maximum charging current for the starter battery and any other batteries should not exceed 40 Amps.” I downloaded the guidelines and I’ve tried to find this reference to not exceeding 40 Amps, but I can’t find it. Can you tell me what page number I can find that on? Thanks! The BEG gets updated pretty regularly. In my version it’s in section 7.3.1 “Retrofitting an additional battery”. If you want a quick visual of that section, it’s in this image. Electrical Grounding question if : I installed the BlueSea ACR, in which the wire diagram shows a connection from the (- ) start battery post to the (-) bus bar for house battery. The diagram also shows a ground from the bus bar. If I ground the bus bar, will this defeat the Start battery disconnect above the gas pedal? The ACR diagram does not show a Start Battery ground, it uses the ground from the bus bar. Thanks for your help with all of this stuff. I was successful with installing house system/solar/isolator/inverter without the van burning down. I also took your suggestion about turning the Espar 90 degrees. Finishing that up before heading to Moab on Friday.. Thanks for your wonderful site and hard work! Tim, good job not burning down your van so far. That’s always a positive! Blue Sea’s circuit diagrams are very generic and don’t take into account how your van’s battery is connected (and the quick disconnect). The ACR is a relatively high current device, which is probably why Blue Sea suggest connecting its positive terminals directly to the battery. That way, you don’t have to consider the gauge of the van’s wires in the circuit. In your van, “ground” and the negative battery terminal are the same thing (or at least, they are connected already). Any part of the van’s chassis is electrically connected to the negative battery terminal. That’s why you’ll see clusters of brown wires attached to chassis bolts at various places around the vehicle, like under the driver’s seat. The start battery disconnect is on one of the positive circuits coming from the start battery. It goes on to power most of the van’s electronics and electrical systems. When you wire up the ACR, it connects to the positive terminal of your starter battery and your house battery. These connections are the high current carriers. It also needs a negative (ground) connection so that it completes a circuit and has a potential difference (voltage) across it for the ACR’s innards to work their magic. That wire has a tiny fuse on it – it’s not designed to carry much current. You can hook it up to any chassis connection point you’d like. Aloha from Alaska… lots of great info, thanks !!!! Is it possible to wire a Sterling type of 12v DC-DC charger using the aux battery relay location under the drivers seat ?? (2017 4×4) I actually want to remove my factory aux battery & cables under the hood, use the relay position under the drivers seat to wire to a DC-DC charger near my rear axle where I have an underfloor box with 2 Battleborn 100Ah LiFePO4 batteries, I also have 340w of solar thru a Victron MPPT as well as shore power via a Magnum charger/inverter..
I’m really hoping I can just run proper cable from the underseat aux battery relay location back to a Sterling for the house batteries (along with my solar & shore charging) and put a locking tool box under the hood where the factory aux battery is.. Thanks again for any input !!! Hi JR. It’s *possible* to wire the DC-DC charger that way. In fact several people have. Just remember to calculate the wire gauge that you use for the rest of the run to the batteries, etc. based on the total length of cable, not just the piece that you add. The wire to the relay is around 1 gauge, according to the electrical diagrams for the van. The issue with doing it this way is twofold: fusing the wire, and whether you want to keep the relay in the circuit or not. I can’t remember offhand whether the aux battery cable is fused anywhere along its length. Check that before you use it and design your circuit accordingly. The OEM relay is big enough to handle the Sterling’s load, but considering the Sterling has its own logic built in for when to charge, it’s probably best to remove that OEM relay from the equation.